We have not had one of these in awhile, so though I would post another! Here are the "base model" 2dr GM full-size cars from 1971-72. We normally do the fanciest models, but this time, no, its the base models. Which do you find more appealing? 1971 Oldsmobile Delta 88 coupe (This is the more luxurious "Royale" model, as the photo for the base model was small). I love the two door Delta 88 hardtop. Heck, I'm a sucker for full size cars of those years. I'm really excitable over the Chevelle/Malibu Wagons too. Me too... I love most all early 70s big cars. I have two already. lol. Notice how the 71' models have the dual stripe white walls... looks like by 72' that was gone. I have a 72' Caprice wagon and I have alot of factory ads and brochures and the 72's had the one stripe tires... the photo of the 71's had the dual stripe. I kinda like the dual stripe better. Always been a sucker for those big 2 doors. I like the 71 Impala coupe the best....but I did not know in '71 you could get a new Impala in Sunflower Yellow. Yikes. Just doesn't go witht he car IMO. My vote went to the Olds, but all of them look great. Generally I can't stand this particular class of cars, but I have great memories of driving my brother-in-laws dealer Catalina convertible. All excess, practically no practicality, but the chicks dug it. That Buick is 220" long. It would never fit in my garage. None of the vehicles would. I like the proportions of the Buick and Olds look better than the others. There is something about the front ends of the others that are just a bit off to me. On the Buick, I like the way the rear portion smoothly flows into the back part of the roof. I like them all and have kinda owned/own similiar cars. I currently own the top of the line station wagon version of the Chevy wagon and the top of the line 4dr version of the Pontiac and I have owned a 72' Buick Electra 4dr and in the 80s, we owned a 1972 Olds Delta 88 Royale 2dr. I prefer the 4drs and wagons, but like these too. I voted Chevrolet and Pontiac, but I like them all as mentioned. One thing you cant see are the interiors on most of these but I know what they look like... I like the inside of the Buick the best, then the Pontiac, then Chevrolet, then Oldsmobile. The Oldsmobiles instrument cluster really never appealed to me like the others did for some reason. I may post another one with the "top of the line" 2drs of those cars. I know we had the 4dr thread in the past and the Chevrolet one out in that one as well. 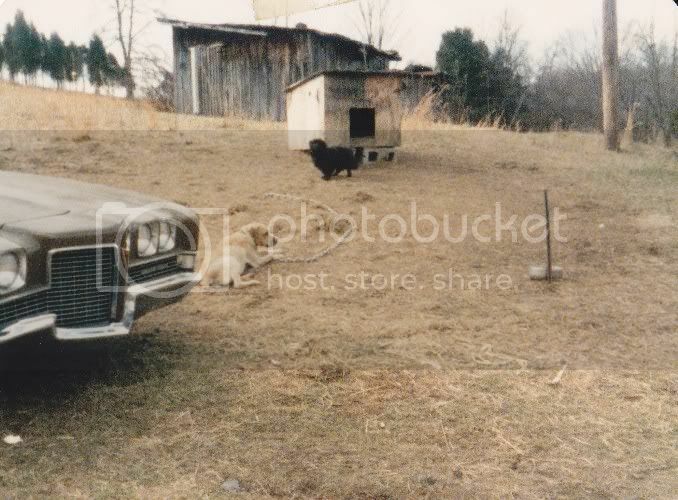 Here is a photo taken in January of 1986 of our old 1972 Oldsmobile Delta 88 Royale 2dr hardtop... this was grandpas car in the 70s and it was ours from 1985 until 1989 when my dad traded it for a Kenmore microwave!!!! Yes, its true. He felt sorry for a friend that needed a car. I remember it was a very high optioned car as well. Can you believe we still have the microwave out in the workshop and it still works??!! It (microwave) is dated 1987... unbelieveable. Beside of it is our old 1971 Lincoln Continental (which ironically was my grandmothers car in the 70s and early 80s). We had it from 1985-1990, when my dad traded it for a 1977 Mercury Bobcat Villager wagon. around the same time we (actually it was my uncles who bought solely for the engine ) also had a 1971 Pontiac Grand Ville 4dr... you can only see the front of it in this photo also taken in January of 1986, as this photo was focused on Brutus and Teddy (our dogs), rest their souls.... they have been dead for many years obviously.